1 Minh, Ho Chi, ‘Tuyen Ngon Doc Dap [Declaration of Independence]’ in: Ho Chi Minh Toan Tap 1930–1945, Tap 3 [Ho Chi Minh's Collected Works 1930–1945, vol. 3] (Hanoi 1983) 383. For a contemporary Vietnamese account of the events of 2 September 1945, see Tung Hiep, ‘Horn Nay la Ngay Doc Lap! [Today is Independence Day! ]’, 9 September 1945, Trung Bac Chu Nhal [Center and Northern Sunday Magazine]. On the presence of American P-38 planes over Hanoi, see Charlton, Michael and Moncrieff, Anthony, Many Reasons Why: The American Involvement in Vietnam (New York 1978) 13–14. 2 Vo Nguyen Giap's address and its discussion of the United States is reprinted in Tran Huy Lieu, et al., Tai Lieu Tham Khao Lich Su Cach Mang Can Dai Viet Nam, Tap 12: Tong Khoi Nghia Thang Tam [Research Materials on the History of the Contemporary Vietnamese Revolution, Vol. 12: The August Revolution] (Hanoi 1957) 116. The pro-American placards and banners at the independence day parade were visible in documentary footage of the event in the collection of the Vietnamese Ministry of Culture. 3 For a fuller account of the place of the United States in Vietnamese anti-colonial thought, see Bradley, M., ‘Imagining Vietnam: The United States in Radical Vietnamese Anticolonial Discourse’, Journal of American-East Asian Relations 4/2 (Winter 1995) 299–329. 4 Although differing in scope and aims, my approach to the August revolution and the place of America in it is indebted to the foundational work of David Marr and Stein Tonnesson. See Marr, , Vietnam 1945: Quest for Power (Berkeley 1995) and Tonnesson, , The Vietnamese Revolution of 1945: Roosevelt, Ho Chi Minh and de Gaulle in a World at War (London 1991). 5 On ICP perceptions of the outbreak of World War II, see Nam, Pham Xuan, ‘Ve Nhung Nguyen Nhan Phat Sinh Cuoc Chien Tranh The Gioi Thu Hai (Xet theo nhan dinh cua nhung nguoi cong san Viet Nam luc do) [On the Causes of the Outbreak of the Second World War (As understood by Vietnamese communists at the time)]’, Nghien Cuu Lich Su 5 (1979) 67–79 and Toan, Nguyen Khanh, ‘Ve Nguyen Nhan Phat Sinh Cuoc Chien Tranh The Gioi Thu Hai [On the Causes of the Outbreak of the Second World War]’, Nghien Cuu Lich Su 6 (1979) 1–16. 6 ‘Chinh Sach Moi Cua Dang [New Policies of the Party]’ contained in the resolutions of the Eighth Plenum of the Central Committee of the Indochinese Communist Party [Hoi Nghi Trung Uong Lan Thu VIII Dang Cong San Dong-Duong] of May 1941 as reprinted in Ban Chap Hanh Trung Uong Dang Cong San Viet-Nam, Van Kien Dang 1930–1945, Tap III [Party Documents 1930–1945, Volume 3] (Hanoi 1977) 203. 7 The organisation and tactics of the Viet Minh are outlined in ‘Viet-Nam Doc Lap Dong Minh: Tuyen Ngon, Chuong Trinh, Dieu Le (25–10–41) [Independence League of Vietnam: Declaration, Progam, By-Laws (25 October 1941)]’, reprinted in Van Kien Dang, 431–50. For existing Westernern scholarly analyses of the origins of the Viet Minh, see Khanh, Huynh Kim, Vietnamese Communism 1925–1945 (Ithaca 1982) 263–269 and Duiker, William J., The Communist Road to Power in Vietnam (Boudler 1981) 68–69. As both Duiker and Khanh point out, the ICP had advocated united fronts in 1930s, including the Antiimperialist Front (1930–1931) and the Democratic Front (1937–1939), but they had not been particularly successful. 8 ‘Viet-Nam Doc Lap Dong Minh: Tuyen Ngon, Chuong Trinh, Dieu Le (25–10–41) [Independence League of Vietnam: Declaration, Progam, By-Laws (25 October 1941)]’, reprinted in Van Kien Dang, 435, 442. Even more explicit was Ho Chi Minh's History of Our Country [Lich Su Nuoc Ta], written and disseminated in early 1942, which consciously drew upon the reform generation leader Phan Boi Chau's well-known verse histories of Vietnamese patriotic leaders to call forth a renewed spirit of voluntarism. 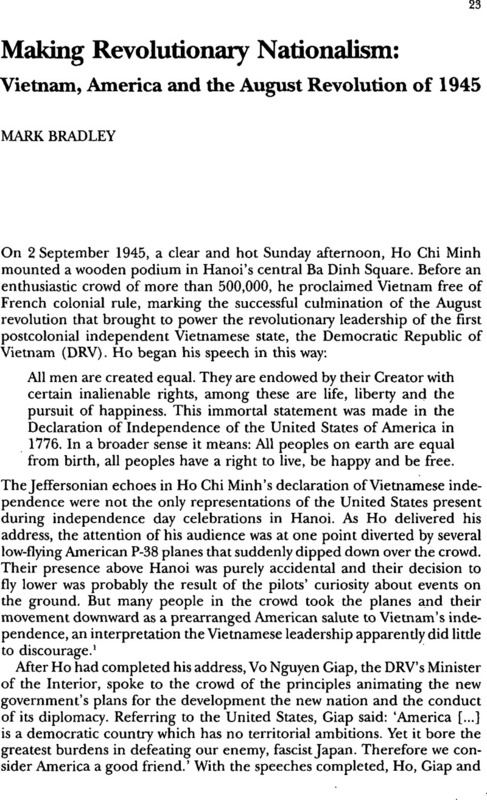 Ho employed similar rhetorical devices as the editor of Vietnam Independence [Viet Nam Doc Lap], a handwritten, two-page weekly newspaper established after the Pac Bo plenum to win support for the Viet Minh that was widely circulated in northern Vietnam. See Minh, Ho Chi, ‘Lich Su Nuoc Ta [History of Our Country]’ in: Ho Chi Minh Toan Tap 1930–1945, Tap 3 [Ho Chi Minh's Collected Works 1930–1945, Vol. 3] 215–224; 10 September 1941, 1 December 1941, 1 January 1942, 21 February 1942, 11 March 1942, Viet Nam Doc Lap [Vietnam Independence]. 9 Van Kien Dang, 203. 10 Van Kien Dang, 205. 11 Van Kien Dang, 205. 12 Van Kien Dang, 201–202; Ho Chi Minh, ‘Lich Su Nuoc Ta [History of Our Country]’ in: Ho Chi Minh Toan Tap 1930–1945, Tap 3, 222. 13 On party organising efforts after the Pac Bo Plenum, see Hoc, Vien Su, Tai Lieu Tham Khao Cach Mang Thang Tham (Tong Khoi Nghia o Ha Noi va CacDia Phuong), Tap 1 [Research Documents on the August Revolution (in the General Uprising in Hanoi and Other Regions), Volume 1] (Hanoi 1960) 9–17, 197–198, 313–330; and Nguyen Thanh, Bao Chi Cach Mang Viet Nam 1925–1945, 282–295. On French repression in 1941 and 1942, see Ban Nghien Cuu Lich Su Quan Doi Thuoc Cue Chinh Tri [Board for the History Study of the Army in the Political Department], Lich Su Quan Doi Nhan Dan Viet Nam [History of the People's Army of Vietnam] (Hanoi 1974) 76–90; Elliot, Mai, trans., Reminiscences on the Army fin-National Salvation: Memoirs of General Chu Van Tan (Ithaca 1974) 76–114; and Lockhart, Greg, A Nation in Arms: The Origins of the People's Army in Vietnam (Sydney 1989) 84–88. 14 The forty-seven issues of Vietnam Independence published between August 1941 and December 1942 all contained extended discussions of the war in Europe and Asia. National Salvation, which appeared more irregularly in this period, tended to focus on developments in the Pacific theater. 15 Ho Chi Minh, ‘Cac Bao Dang Tin Hoi Hop Lon Hoan Nghenh Uy-Ki [News Report: Willike Given A Warm Reception]’ and ‘Doan Dai Bieu Anh Sang Tham Trung-Hoa [A British Delegation in China]’ in: Ho Chi Minh Toan Tap 1930–1945, Tap 3: 275–276, 321; translations from ‘Ho Chi Minh's “Prison Diary”’ in: Marr, David G. ed., Reflections from Captivity (Athens Ohio, 1978) 77, 87. Ho's initiatives to China and his prison experiences are discussed in Hoang Tranh, Ho Chi Minh voi Trung Quoc [Ho Chi Minh and China] (Nha Xuat Ban Sao Moi, 1990) 140–166 and Chen, King C., Vietnam and China 1938–1954 (Princeton 1969) 55–60. 16 ICP perceptions of the changing international environment and its impact on Vietnam are discussed in a party training manual written by Truong Chinh in 1943 entided ‘Chien Tranh Thai-Binh-Duong va Cach Mang Giai Phong Doan Toe Dong Duong [The Pacific War and the Indochinese National Liberation Revolution]’; original edition consulted at the Museum of Revolution, Hanoi. On the February 1943 meeting of the Standing Committee, see ‘Nghi Quyet cua Ban Thuong Vu Trung Uong Dang Con San Dong-Duong (hop ngay 25–28/2/1943) [Resolutions of the Central Committee of the Indo-Chinese Communist Party (convened 25–28 February 1943)]’ in: Van Kien Dang, 313–362 and Khanh, Vietnamese Communism, 271–272. 17 On the formation of the cultural front policy and its enduring significance, see ‘Nghi Quyet cua Ban Thuong Vu Trung Uong Dang Con San Dong-Duong (hop ngay 25–28/ 2/1943) [Resolutions of the Central Committee of the Indochinese Communist Party (convened 25–28 February 1943)]’ in: Van KienDang, 346; Chinh, Truong, ‘Marxism and Vietnamese Culture’, in his Selected Writings (Hanoi 1977) 255–259; Jamieson, Neil L., Understanding Vietnam (Berkeley 1993) 182–191; and Khanh, Vietnamese Communism, 273–275. On the resurgence of voluntarism, see Song Hong, ‘La thi si [To Be a Poet]’, 18 April 1944, in: Co Giai Phong [Flag of Liberation]; Pham The Ngu, Viet Nam Van Hoc Su Gian Uoc Tan Bien, Tap 3: Van Hoc Hien Dai, 1862–1945 [A New Outline History of Vietnamese Literature, Volume 3: Contemporary Literature, 1862–1945] (Saigon 1965) 611–612. 18 Vu Dinh Hoe, along with several other prominent urban intellectuals associated with the cultural front, would serve in the cabinet of the Viet Minh's provisional government in 1945; see Devillers, Philippe, Histoire du Viet Nam de 1940 a 1952 (Paris 1952) 177–178. 19 See 1 November 1942, 1 January 1943, 25 March 1944, ljuly 1944, 7 October 1944, 14 October 1944, 16 December 1944, 27 January 1945, 5 February 1945, Thanh Nghi. 20 For two important examples from the 1920s, see Tinh Tien, Van Minh Au My [European and American Civilization] (Hue 1928); and Ho Chi Minh, ‘Lich Su Cach Menh My [History of the American Revolution]’ in his 1927 Duong Cach Menh [Road to Revolution] reprinted in Ho Chi Minh Toan Tap, Tap 2 [Ho Chi Mink's Collected Works, Volume 2] (Hanoi 1981) 173–254. 21 William Faulkner, ‘Khoi thuoc la [Smoke]’, 3, 10, 17 and 24 June 1944, Thanh Nghi; Sartre, Jean-Paul, ‘American Novelists in French Eyes’, Atlantic Monthly 178/2 (August 1946) 114–115. 22 For the RCA discography available in Vietnam, see Buu Thap cua Cong Ty RCA Victor [Catalog of Recordings by RCA Victor] (Saigon 1940). Among the texts for learning English available in Vietnam during World War II were Kham, Nguyen Khac, Tieng Anh cho Nguoi Viet-Nam [English for Vietnamese Speakers] (Hanoi 1941); Tu, Truong Anh, Nhung Tieng va Cau Huu Ich…: Viet-Phap-Anh [Useful Words and Phrases…: Vietnamese-French-Engtish] (Hanoi 1940); Phan, Tran Ngoc, Anh My Ngu Tu [Self-Taught English] (Hai Phong 1945); and Xuan, Nguyen Thuong and Dong, Nguyen Huu, Anh Ngu Tu Hoc [English Self-Instruction] (Hanoi 1945). 23 On party reassessments of the place of China, Britain and the United States in Viet Minh strategy in the winter and spring of 1943, see ‘Nghi Quyet cua Ban Thuong Vu Trung Uong Dang Cong San Dong-Duong (hop ngay 25–28/2/1943) [Resolutions of the Central Committee of the Indochinese Communist Party (convened 25–28 February 1943)]’ in: Van Kiev. Dang, 360–361; 10 February 1943, Cuu Quoc, and 1 May 1943, Viet Nam Doc Lap. 24 10 February 1943, Cuu Quoc. On continuing French repression in 1943 and 1944 and the difficulties it posed for Viet Minh organising, see Lieu, Tran Huy, et al. , Tai Lieu Tham Khao Lich Su Cach Mang Can Dai Viet Nam, Tap 1 [Research Documents on the History of Vietnam's Modem Revolution, Volume 1] (Hanoi 1955) 67–73 and Lockhart, Nation in Arms, 87–88. 25 November 1944, Cuu Quoc, 3. For a discussion of Sino-Vietnamese diplomay in this period, see in Hoang Tranh, Ho Chi Minh voi Trung Quoc [Ho Chi Minh and China] 166–192 and Chen, Vietnam and China, 60–85. 26 The memoirs of Hoang Quoc Viet and Hoang Van Hoan, who after Ho Chi Minh were most closely involved with the Viet Minh's Chinese initatives, provide insight into internal party thinking on the Sino-Vietnamese relationship; see Viet, Hoang Quoc, ‘Peuple héroīque’ in: Récits de la résistance vietnamienne (1925–1945) (Paris 1966) 190–292 and Van Hoan, Hoang, Giol Nuoc trong Bien Ca: Hoi Ky Chach Mang [A Drop of Water in the Ocean: Memoirs] (Beijing 1986) 233–252. 27 On Pham Van Dong's efforts to seek Ho's release, see Central Committee to the Indochina Section of the International Anti-Agression Association at Hanoi to the American Ambassador, 25 October 1943 and Central Committee to Chiang Kai-shek, 25 October 1943 in Gauss to Secretary of State, 23 December 1943, 851G.00/95, U.S. Department of State Decimal Files, Record Group 54, National Archives, Washington, D.C.
28 On the organisation of the Viet Minh delegation at Kuming and biographical information on Pham Viet Tu, see ‘The National Movement in Indo-China’, 28 August 1944, Operational Intelligence Report, Office of Strategic Services (OSS), Kunming, Folder 273, Box 35, Entry 140, Records of the Office of Strategic Services, Record Group 226, National Archives, Washington, D.C.
29 Pham Viet Tu to American Ambassador in China, 18 August 1944 and ‘Indochina from the French Occupation in 1886 to Up to the Present’, enclosed in Langdon to Gauss, 24 August 1944, 851G.00/8–2444, RG 59. For another example of the Viet Minh delegation in Kunming to seek American support, see Pham Viet Tu to Senator Arthur Capper, 29 August 1944, Folder 35–273, Entry 140, RG 226. The letter to Senator Capper was apparently initiated after Pham Viet Tu received a copy of the 9 July 1944 issue of the Congressional Record that contained a transcript speech by Capper on the Senate floor praising the courage of the Indochinese people in the face of Japanese aggression. 30 Memorandum of Conversation, 7 September 1944 enclosed in Langdon to Secretary of State, 9 September 1944, 851G.00/9–944. 31 February 1945, Viet Nam Doc Lap. My discussion of the Viet Minh rescue of the American pilot also draws upon my interview with General Dam Quang Trung in Hanoi in 1989 who was active in the Viet Minh militia in northern Vietnam in November 1944 and later worked with one of the OSS missions to Vietnam in the summer of 1945. 32 February 1945, Viet Nam Doc Lap. For a consideration of other efforts to draw on Allied prestige, see Nguyen Trong Hau, ‘Van De Tim Ban Dong Minh Xa Qua Bao Viet Nam Doc Lap (1941–1945) [On the Issue of Friendship with the Allies in Vietnamese Independence (1941–1945)]’ (Unpublished Manuscript). For a useful discussion of the rise of political cartoons in Vietnam, a novel development in colonial Vietnam, see Van Ky, Nguyen, La société Vietnamienne face à la modemité (Paris 1995) 191–228. 33 Lucius, ‘Letter from Indochina’, February 1945, Box 1393, Entry 16, RG 226: 8. On Ho's work with the OSS and other American military personnel in China, see Charles Fenn to Robert Hall, 22 October 1944, Folder 340, Box 42D, Entry 140, RG 226; Hoang Van Hoan, Giot Nuoc, 245–246; Fenn, Charles, Ho Chi Minh: A Biographical Introduction (New York 1973) 72–84; and Chen, Vietnam and China, 93. For other examples of the use of the Philippines in official discourse, see 25 December 1944, Viet Nam Doc Lap and the 21 November 1944 issue of Dong Minh [Allies] in: Royere to Pechkoff, 16 January 1945, Folder Title: ‘Mouvement revolutionnaire Annamite, 8/26/44–4/49, E165–2’, Volume 161, Indochine, Asie- Oceanie 1944–1955, Ministere des Affaires Etrangeres Archives Diplomatiques, Paris. 34 Excerpt from an irregular journal produced by the Viet Minh in Saigon entitled Rang Dong cua Dan Toe [Dawn of a People], c. 1944, contained in ‘Rapport: Le parti communiste en Cochinchine’, 21 February 1945, Conseiller politique 192, Dépôt des archives d’outre mer, Archives nationales, Aix-en-Provence, France. 35 See 15 June 1944, 20 July 1944, 15 December 1944, 25 January 1945, 13 February 1945, Viet Nam Doc Lap; 20 August 1944, 30 October 1944, Cuu Quoc, 10 November 1944, Co Ciai Phong, and ‘Indochinese Revolutionary Party Pamphlet’, 24 August 1944, Box 1094, Entry 16, RG 226. 36 30 January 1945, Cuu Quoc, 4 March 1945, Viet Nam Doc Lap. 37 The fullest account of these events and the coming of the August Revolution is contained in Marr, Vietnam. 1945, chapters 5 and 6. 38 ‘Nhat Phap Dan Nhau va Hanh Dong cua Ta: Chi Thi cua Ban Tuong Vu Trung Uong Dang Cong San Dong-duong ngay 12–3–1945 [Our Action in Relations to the Franco-Japanese Conflict: Instruction of the Standing Committee of the Central Committee of the Indochinese Communist Party, 12 March 1945]’ in: Van Kien Dang, 391–92. On the broader impact of the Japanese coup and the resulting vacuum of power, see Khanh, Vietnamese Communism, 291–309. 39 Khanh, Vietnamese Communism, 333–338. 40 On Ho's meeting with Chennault, see Hoang Van Hoan, Giot Nuoc, 245–46. On OSS encounters with Ho Chi Minh following the Japanese coup, see ‘Position of the Annamite Communistic Group’, 2 March 1945, Box 434, Entry 19, RG 226; Charles Fenn, Ho Chi Minh, 76–79; and Archimedes Patti, Why Viet Nam?, 84–88. My discussion of the Deer Team missions draws upon: ‘Report on Deer Mission’, 17 September 1945, Folder 3377, Box 199, Entry 154, RG 226; Giap, Vo Nguyen, Khu Giai Phong [The Liberated Zone] (Hanoi 1946) and interviews with Allison K. Thomas in East Lansing, Michigan and Dam Quang Trung in Hanoi in 1989. 41 No Vietnamese or American transcripts of these conversations survive. This account relies on Patti, Why Viet Nam?, 151–255, supplemented by my interview with Hoang Minh Giam in Hanoi in 1989. 42 This discussion relies on Gallagher's accounts of his meetings with Ho Chi Minh, including ‘French Indo-China (14 September’45–12 Dec. 1945)’.Gallagher toMcClure, 20 September 1945 and Memorandum for the Record, 29 September 1945, Papers of Phillip E. Gallagher, U.S. Army Center for Military History, Washington, D.C.; and interviews with Hoang Minh Giam in Hanoi 1989 and Nguyen Van Tran in Hanoi in 1992. 43 Statement of Frank M. White, 11 May 1972, in United States Senate Committee on Foreign Relations, Hearings on the Causes, Origins and Lessons of the Vietnam War, 152. Ho Chi Minh's encounter with Arthur Hale is discussed in Hale to Holland, 11 December 1945, Papers of Philip E. Gallagher. 44 Ho Chi Minh to Truman, 16 February 1946; Ho Chi Minh to James Byrnes, 1 November 1945 reprinted in U.S. Department of Defense, United States-Vietnam Relations 1945–1967, Volume 1: Vietnam and the United States, 1940–1950 (Washington D.C., 1971) C95- 96, C90. For the complete correspondence sent to Washington by Ho Chi Minh, see also Ho Chi Minh to Truman, 29 September 1945; Ho Chi Minh to Truman, 17 October 1945; Ho Chi Minh to U.S. Secretary of State, 22 October 1945; Ho Chi Minh to Truman, 8 November 1945, Ho Chi Minh to Truman, 23 November 1945; and Ho Chi Minh to James Byrnes, 26 November 1945 reprinted in United States-Vietnam Relations 1945–1967, Volume 1: C69–70, C73–74, C80–81, C84–86, C87–88, C92; Ho Chi Minh to Truman, 18 January 1946, Folder: ‘800IC 1946’, Records of the Nanking Embassy, Record Group 84, National Records Center, Suitland, Maryland; and Ho Chi Minh to Truman, 28 February 1946, Folder 427, Box 53, Entry 140, Record Group 226. 45 Biographical material on Pham Ngoc Thach is based on conversations with scholars at the Institute of History, Hanoi, Vietnam in 1989 and 1992 and ‘Note sur la personnalite de Monsieur Pham Ngoc Thach’, December 1947, ‘Communisme et relations Moscou-Hanoi-Chine’, 174, Indochine, Asie-Oceanie 1944–1955, Archives Diplomatiques, Ministère des Affaires Etrangères, Paris, France. 46 ‘The Political Aims and Philosphy of the Viet Minh Government’, Herbert J. Bluechel, 30 September 1945, Folder 277, Box 25, Entry 100, RG 226; Pham Ngoc Thach, ‘Some Notable Characteristics of the Revolution in August 1945’, c. October 1945, Box 1, Records of Consular Posts, Hanoi, 1950–1952, RG 84, National Records Center, Suidand, Maryland. For Thach's inital approach to the OSS in Saigon in 1945, see Provisory Government of the Republic of Viet-Nam to OSS Major Peter Dewey, 2 September 1945 and Saigon to Kandy, 21 September 1945, Folder: ‘Messages via OSS’, Box 10, Records of the Department of State Philippine and Southeast Asian Affairs Division (PSA), RG 59, National Archives, Washington, D.C.; and Saigon to Kandy Conversations between Thach and American OSS officers in Saigon and the information passed by Thach to American officials are contained in ‘Who's Who of Members of Present Government’, 7 November 1945, XL27712; ‘Viet Minh's Political, Economic and Social Program as Outlined by Dr. Thach’, 7 November 1945, XL27713; ‘History and Political Movements of the Viet Nam’, 17 November 1945, XL27715; ‘Relations Between Vietminh and the French….Report by Dr. Thach’, 12 November 1945, XL27711; ‘Viet-Minh Evidence Against the French’, 13 November 1945, XL 27710; ‘Memorandum of the Southern Executive Committee of Vietnam’, 19 November 1945, XL27716, Box 360, Entry, 19, RG 226; and ‘History and Political Movements of the Viet Nam’, 17 November 1945, Box 365, Entry 19, RG 226. 47 On the character of Sino-Vietnamese relations during the Chinese occupation of the north, see Chen, Vietnam and China, 115–154 and Hoang Tranh, Ho Chi Minh voi Trung Quoc, 196–209. 48 Ho Chi Minh sent a series of cables to Stalin very much like those he sent to Truman in 1945 (and in some cases almost identifcal ones) asking for Soviet recognition and technical support; none of them met with a response from Stalin. See, for instance, Ho Chi Minh to Stalin, 22 September 1945, List 187, File 31, Box 197, Year 29, Fond 0136, Foreign Policy Archives of the Russian Federation [Arkhiv vneshnei politiki Rossiyskoy Federatsii], Moscow cited in Igor Bukharkin, ‘Moscow and Ho Chi Minh, 1945–1969’ (Unpublished Paper, Conference on New Evidence on the Cold War in Asia, University of Hong Kong, January 1996). 49 On initial Vietnamese efforts to court the British, see Pham Ngoc Thach to General Gracey, 16 September 1945, Box 10, Records of the PSA, RG 59; Ho Chi Minh to Council of Ministers, 18 September 1945, FO371/46038, Public Records Office, Kew, England; and ‘Record of an Interview with Dr. Thach on 3rd October 1945’, WO203/5562, Public Records Office. The British mission is analyzed in Dennis, Peter, Troubled Days of Peace: Mountbatten and the South East Asia Command, 1945–46 (New York 1987); and Dunn, Peter M., The First Vietnam War (New York 1985). Dennis takes a more critical view of British policy in Vietnam than does Dunn, whose account provides an extended apologia for British actions in Vietnam. Neither author explores the nature of Viet Minh diplomacy with the British. 50 For two opposing contemporary accounts of the outbreak of fighting in southern Vietnam in late September 1945, see ‘History of the 20th Indian Division’ (n.d.), Gracey Papers 36, Liddell Hart Centre for Military Archives, King's College London, University of London, an official British report of their mission in Saigon; and Tu, Hoc, Nhung Ngay Dau cua Mat Tran Nam Bo [First Days on the South Vietnamese Battlefront] (Hanoi 1945), an eyewitness account of by Viet Minh journalist of the clash between the British and the Vietnamese. On Ho Chi Minh's protest to the British government, see Ho Chi Minh to Prime Minister Atdee, 27 September 1945, WO203/5562, Public Records Office. On Vietnam propaganda directed toward Indian troops, see ‘Appeal to the Indian Officers and Soldiers Among the British Troops’ (n.d.), and ‘Viet Minh Propaganda’, c. October 1945, Gracey Papers 37. On Gracey's views of the Viet Minh, see Gracey to SEAC, 3 October 1945, Gracey Papers 36. On increasing Vietnamese antagonism toward the British, see Noang Cao Nha to Gracey, 11 October 1945, Gracey Papers 54; and Tran Van Giau to Gracey, 10 October 1945, F9532, FO371/46309, Public Records Office. On the October meetings between the British and Pham Ngoc Thach, see Saigon Control Commission to SACSEA, 1 October 1945, WO203/5562; ‘Meeting between British and Vietnamese Officials’, 9 October 1945, Gracey Papers 48; ‘Appendix D: Extracts from Minutes of British-Viet Minh Meetings, Political Report, 13 September to 9 October 1945’, Gracey Papers 36; Report on Political and Economic Conditions in Saigon, c. October 1945, WO203/5562. 51 Huu, Hoi Viet-My Than, Dieu-Le [By-Laws] (Hanoi 1945); ‘History and Origins of the Annamite-American Friendship Association’, 9 October 1945, Folder 3426, Box 202, Entry 154, Record Group 226; ‘First Meeting’, Viet-My Tap Chi [Vietnamese-American Friendship Association Review] (November 1945) 2–3. 52 ‘About Future Relations between Vietnam and the U.S.A.’, Viet-May Tap Chi (Christmas and New Year Edition, 1945–46) 17, 18. 53 Viet-May Tap Chi was published three times between October 1945 and February 1946. A copy of the initial issue is preserved in the Papers of Phillip E. Gallagher; remaining issues are available in the library of Institute of History in Hanoi. 54 On the American commercial presence in Vietnam in 1946, see Rapport sur l'activité des étrangers, 25 September 1946 and 31 October 1946, Folder Title ‘Rapports sur l'Activité des Etrangers’, Conseiller Politique 154, Dépôt des archives d’outre mer, Archives nationales, Aix-en-Provence, France. On American films, see Viet-My Tap Chi (Christmas and New Year Edition, 1945–46) 17; and Hale to Holland, 11 December 1945, Papers of Philip E. Gallagher. 55 For American reports on declining U.S. prestige in Vietnam, see Saigon to Kandy, 27 November 1945, Folder: ‘Kandy Cables In Nov 45’; Saigon to Kandy, 3 December 1945, Folder: ‘Kandy Cables In Dec 45’, Box 3, Entry 53, RG 226; Saigon to Sinapore, 9 January 1946, Folder: ‘Singapore Cables in Jan 46’, Box 3, Entry 53, RG 226; ‘Political Intentions’, XL 34469, 9 January 1946, Box 381, Entry 19, RG 226; and Hale to Holland, 11 December 1945, Papers of Philip E. Gallagher. 56 On the rise of internationalist conceptions of America in this period, see ‘Fond Viet Minh’, 3 March 1946 in: Note, Conseiller diplomatique, 4 February 1948, Folder Title: ‘Premeditation VN dans l'attaque du 19–12’, Conseiller politique supplément 17, Dépôt des archives d’outre mer; and Bach Ho, Lich Su Cac Cuoc Cach Menh Tren The Gioi: Cach Menh Hoa-Ky [History of the Revolution's of the World: The American Revolution] (Vinh 1946) especially 33–36. 57 For an examination of the place of the United States in Vietnamese diplomacy during the war with the French, see my ‘An Improbable Opportunity: America and the Democratic Republic of Vietnam's 1947 Initiative’ in: Werner, Jayne S. ed., The Vietnam War: Vietnamese and American Perspectives; and Huynh, Luu Doan (Armonk 1993) 3–23.